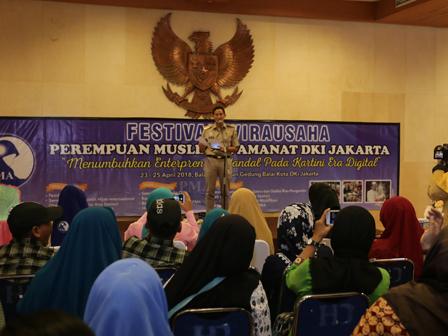 Jakarta Vice Governor, Sandiaga Uno opens Jakarta Perempuan Muslimah Amanat Entrepreneur Festival at City Hall, Jl. Medan Merdeka Selatan, Gambir, Central Jakarta.
" This bazaar is useful to boost economy, create job opportunity, and provide space to do marketing"
With theme "Menumbuhkan Entrepreneur Handal pada Kartini Era Digital" (to grow reliable entrepreneurs for women in digital era), this festival is participated by 70 culinary and handicraft booths. Besides creating job opportunities, this bazaar also becomes a facility for entrepreneurs to sell their commodities. "We support entrepreneur festival, great women, and independent women. This bazaar is useful to boost economy, create job opportunity, and provide space to do marketing," he stated, Monday (4/23). He wants Jakarta Perempuan Muslimah Amanat to sync with One Kecamatan One Center for Entrepreneurship (OK OCE) to develop entrepreneurship in Jakarta. "Later on, it will be paired with OK OCE thus housewives can get training, mentoring, and assistance to do marketing like today. Besides, we will simplify its permit, financial report will be made orderly and properly thus they can get capital easily," he mentioned.